This was published after “Handle With Care” had just come out. There are many references to the album and singles that were spawned from it. 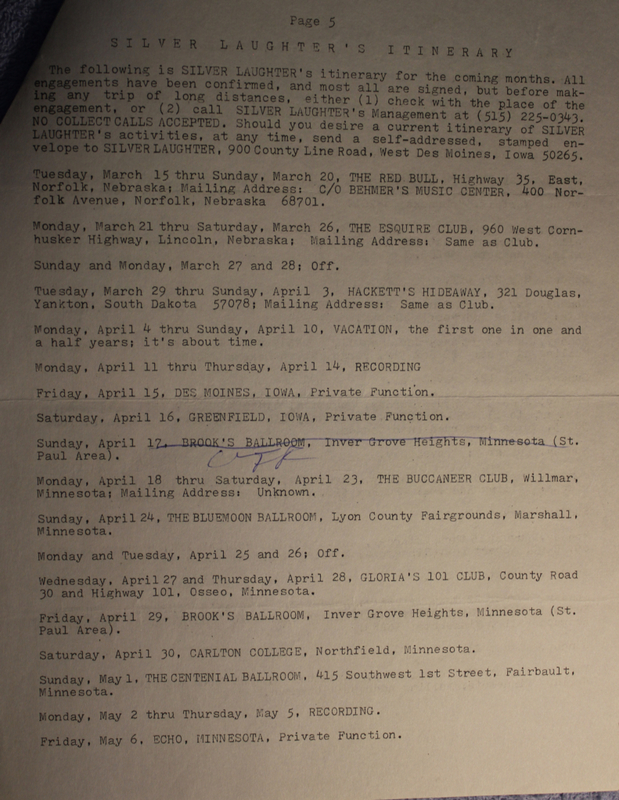 There is also a reference from Art on page one to an agent in Minneapolis he must have been working with to get us booked into the Twin Cities. His name was (is) Greg Stone. It is any coincidence that we later hooked up with sound and light man, Glenn Stone… or that my wife’s name is Janis Stone? Or that Ken used to be called Ken “Stone” by Art? My contribution started at the end of this page and carried over to page two of the newsletter. We must have been fed up with club owners complaining about one thing or another. It’s all I can think of as to why I would insult the hand that fed us! Next on the agenda was Ken who mentioned the upcoming second album and the fact that he would be contributing two songs this time (by popular request from Steve Elliott). 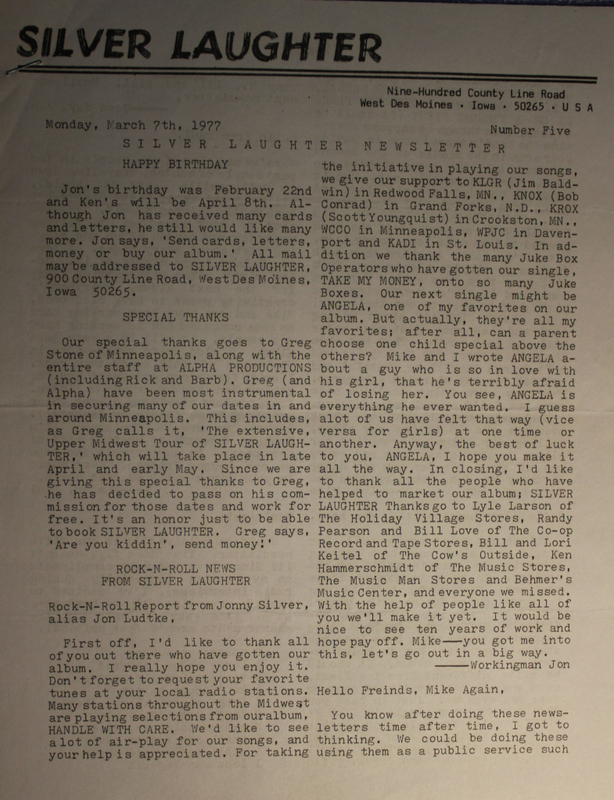 Paul’s contribution also mentions the upcoming second album (at that time it had not been named). Then Carl had his input which happened to be one of his (and the band’s) favorite dishes, hamburger soup. Could this be one of the reasons I am now on cholesterol medicine? 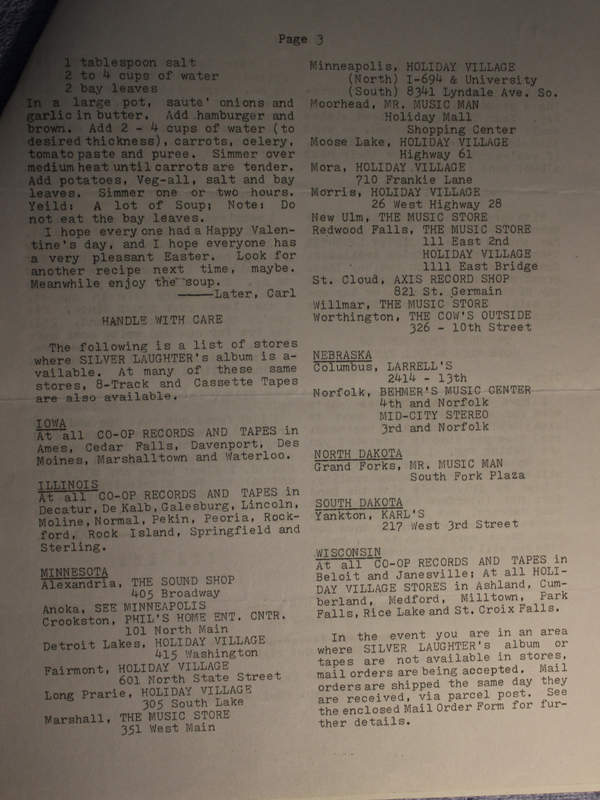 Page three was a promotion of the stores that were carrying “Handle With Care”. Art never missed an opportunity to promote us and our music! As you can see, it was available in a lot of stores around the Midwest. We also hawked them off the stage during our breaks. Paul was the main salesman with that smooth voice of his! 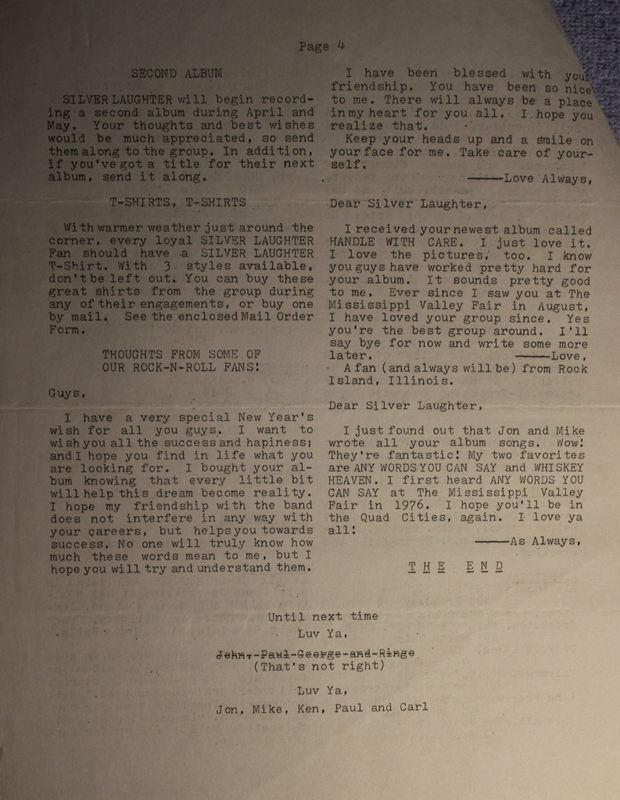 The next page (number four) announced the second album as our next big project, there is a pitch for Silver Laughter t-shirts and the finally, some letters from fans. 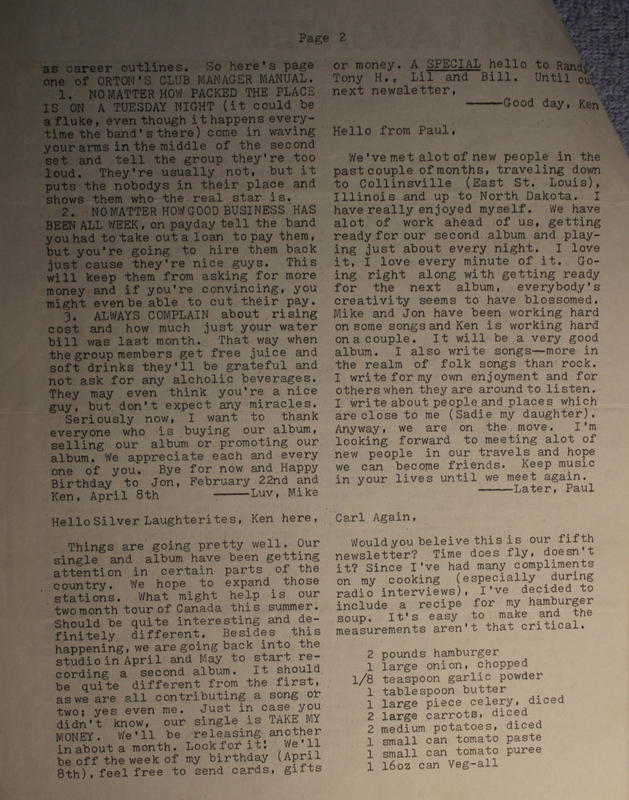 This newsletter was a little longer than the others since it went over to another two pages which announced our itinerary for March, April, May, June and August. At that time we had NOTHING booked for July. However, it was only March when this publication went out, so there was no reason for us to panic. March put us in some of our favorite venues like The Red Bull in Norfolk, NE and Hackett’s Hideaway in Yankton, SD. It also shows the date we started recording “Sailing on Fantasies” as April 11th which lasted for four days through the 14th. It looks like the studio was followed by a few one night stands (which I have previously stated were not our favorites because of all the work of traveling there, setting up, playing, tearing down and driving to the next job) in a row. Then back into the studio on May 2 for four more days of recording. 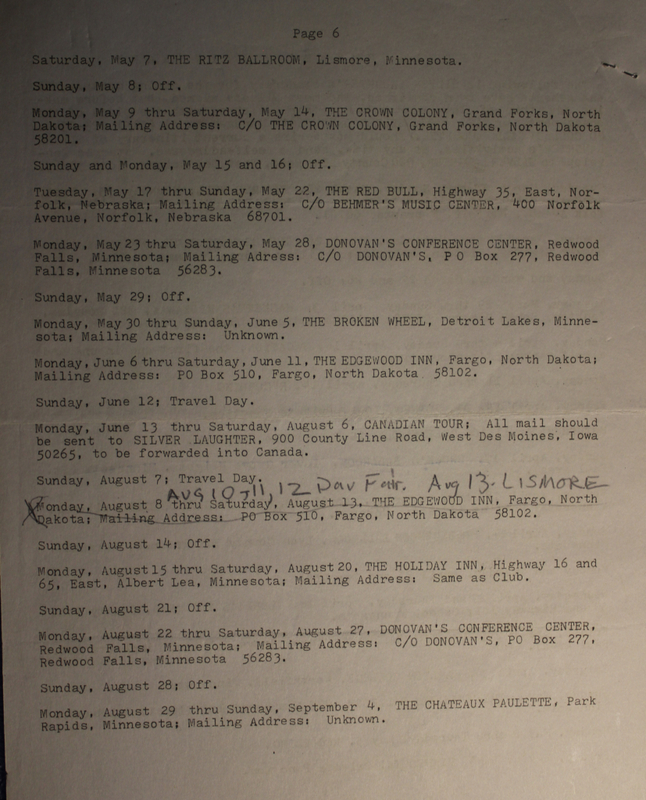 Finally, the last page finished up with what we had booked for May, June and August including the now famous Canadian tour as well as some corrections written by hand, probably by Carl.